Painting quality homes and businesses since 1976. Chris Bialuski, owner/ operator of PAINTING Guys apprenticed under Glen Wheatley, a talented and respected journeyman painter from Regina Saskatchewan. "Back in the day"painters had to know the painting and decorating trade inside and out. Wood staining, wood finishing , cabinet finishing, floor finishing, paper hanging, and general painting was all part of the the painters workflow. "We even tinted our putty to match the various grain colours in wood so nails holes etc were hidden. 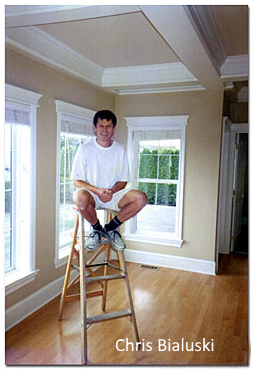 We weren't just "painters" we were applicator for many finishes. Thus, the name Painting & Decorating"
Regardless of any project, PAINTING Guys will see any project, large or small done to the highest standards. See our Testimonials We always beautifully finish new or occupied homes and businesses with the best standards and materials available, finishing everything in a neat and timely manner. Don't hesitate to call us for whatever project you have in mind.